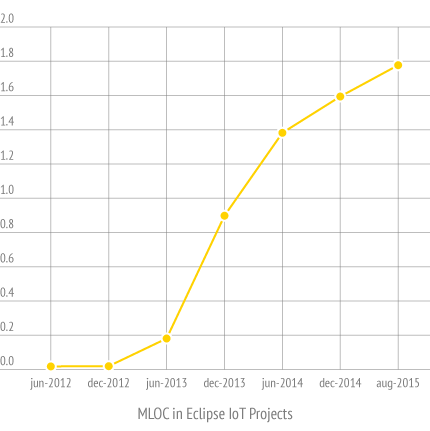 About 9 months ago, I published a blog post showing up some interesting metrics about the Eclipse IoT open-source community. It is one thing to develop open source IoT technology (and Eclipse is definitely not the only organization working on it) but it’s quite another thing to do this in a transparent and open manner. At Eclipse IoT, over the last year, 125 different developers have been writing code and fixing bugs. What’s more, they come from 20+ different organizations, demonstrating that open collaboration is not only possible, it is key to ensure technology adoption and long-term support. The Eclipse IoT portfolio is very rich (from protocols implementations, to frameworks for building IoT gateways, to tools and libraries for industrial automation), so it is no surprise that we now have a very solid code base, with over 1.8 million lines of code (yes, you read that right!). It is also interesting to see the progression over the years, demonstrating that a majority of the projects are under actual development. So while we believe Java is important for IoT, in particular due to the very large ecosystem of developers familiar with it across the whole IT industry, we also recognize the importance of being language agnostic to make sure that IoT developers have access to good open source libraries for their platform of choice. I would really like to hear your comments on these findings, and would be happy to discuss how this relates to your current experiences in the world of IoT. Feel free to use the comments below! Note: most of the metrics related to Eclipse IoT are readily accessible from our dashboard. Some extra analysis of the source code repositories has been conducted to e.g. compute the lines of codes. Where is the forum to ask questions about ECLIPSE IOT? I have a sensor PCB that I’ve developed and I’d like to learn how I can fit it and use COAP to communicate with an ECLIPSE IOT. Also, is there a gateway device that comes ready for deploying the gateway software? We don’t have a specific forum for the questions about Eclipse IoT at large, so I would suggest you turn to StackOverflow, where many of our contributors hang out, or just head to the IoT Working Group mailing list where you could also ask for more details the best approach to solve your problem. In terms of “ready-to-use” gateway device, companies like e.g. Eurotech provide devices that run Kura underneath, so that would allow to deploy virtually any piece of software develop for Kura.